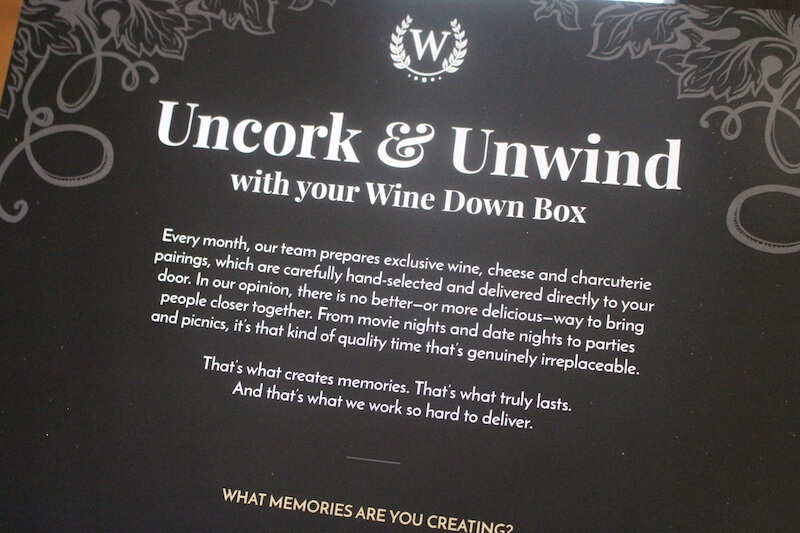 Wine Down Box Review: How Is This Wine Club Different? Notes: The wines included in your box are truly “small batch” because they were impossible to find anywhere for price comparison! Wine Down Box was truly a unique club among the many food/drink subscription services I've tried this year. They delivery a small-batch wine every month, along with cheese and charcuterie to pair with it. Every drop and bite was delicious. However, the lack of variety in pairing snacks was a bummer after several months of subscription. Flavors changed, but brands remained the same. Though the wine was great, it was difficult to justify the premium price over other wine clubs when the thing that made this club "unique" stopped being exciting. Overall, I think I'd rather get a great wine club for a cheaper price and buy my own snacks, or get a great cheese club and pair my own wine. You might have come here for the wine, but I came for the cheese. That's what makes Wine Down Box Unique. This is not just a wine club, it's a wine & cheese pairing club. As I'm finding out in my (delicious) research, there are no shortages of cheese of the month clubs available throughout the USA. However, there are many, many more wine of the month clubs. In places that actually produce wine like California (where I live), there are also many options which are not advertised online. So why does Wine Down Box seem to be the only cheese AND wine of the month club? Sure, many of these clubs will come with recommendations of how to pair, but none actually do the work for you. That's the main reason I was excited to try Wine Down Box! Since they do the pairing and sensory guides, I just get to enjoy the show. Wine Down Box faithfully delivered their subscription box on the 25th of each month for the three-month subscription I signed up for. I also received a confirmation email each time my shipment was sent out, so I knew it was on it's way. *NEW PRICING: The new pricing model includes shipping, so it looks more expensive out of the gate. However, they are now offering bigger discounts on long-term subscriptions, and even offer a 1-month subscription for people that want to try it out. 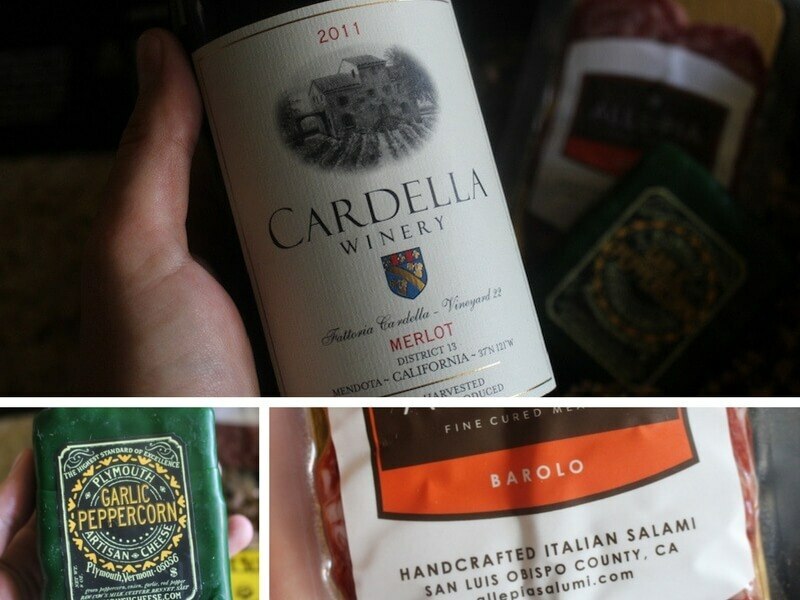 I was most impressed with the quality of the wine included in my Wine Down Box shipments. Before writing this review, my idea was to compare the prices of wine that you could buy in the store. Many times, with monthly club subscriptions, it's a lot cheaper to just go buy the items yourself. This was the case with Flaviar, a whiskey of the month club I tried. However, I simply couldn't find any of the wines that Wine Down Box sent! Exclusivity is always a fun feature of a club, so kudos to finding hard-to-get wine for us guys. As far as the quality of the wine, my best assessment is that it was good. Helpful, right? Normally I'm a beer drinker, so I don't have that much to say about wine. But I do know high quality booze versus swill, so my opinion is that they were not messing around with the wines they sent. Great stuff! Though I don't drink wine as often as beer, I'm normally a bold, thick, red wine guy. However, the rosé and sauvignon blanc that I've received so far were delicious and I've started to rethink my limited scope of wine preference. There are hundreds of wine clubs out there, but my interest in Wine Down Box started researching cheese of the month clubs, so my main interest here was the cheese. Both boxes I've got so far were from the same creamery, Plymouth Artisan Cheese out of Vermont. No doubt Vermont has some famous cheese! 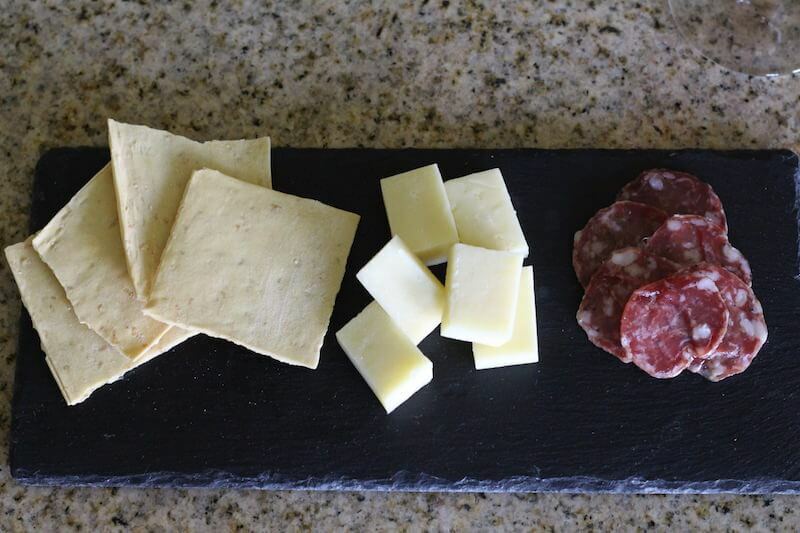 Both salamis were from Alle-Pia, a San Luis Obispo company making artisanal Italian salami. All items were delicious, however, I was disappointed in the lack of variety. Both packages arrived exactly the same: a bottle of wine, a block of cheese, and a vacuum packed salami pack from the same companies as last time. The crackers were exactly the same as last box! 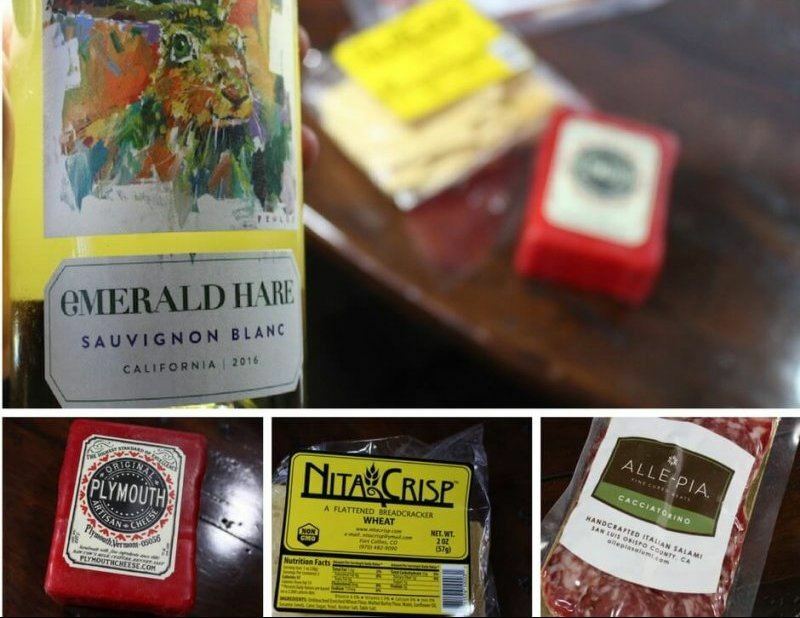 Looking back on past subscription boxes from Wine Down Box, they do variate the cheese and charcuterie selections. It seems that I just happened to get two months in a row that used the same companies. 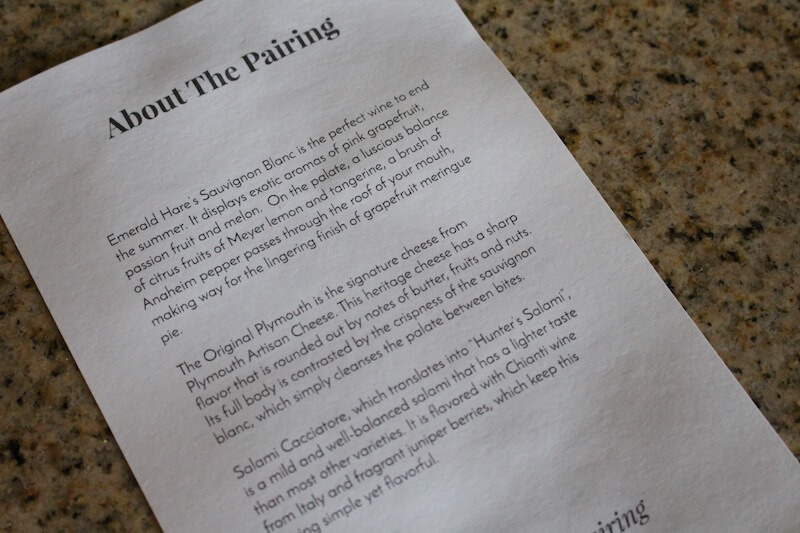 As a wine drinker without a very discerning palate, it was difficult for me to tell the difference between the cheeses and salamis from month to month, so I think I would have enjoyed having different brands, different packaging, and a bigger difference in flavors. For the first month, I really wanted to break down the cost of the package. $67 seemed like a lot of money to spend on cheese and wine! After my investigation, I found out that it really wasn't as expensive as I thought. I looked up the retail prices of each item. The total was about $49. Considering shipping food and alcohol is expensive, and their business has to make money, $67 is a very appropriate price to charge. Drinking rosé wine was an interesting experience for me. 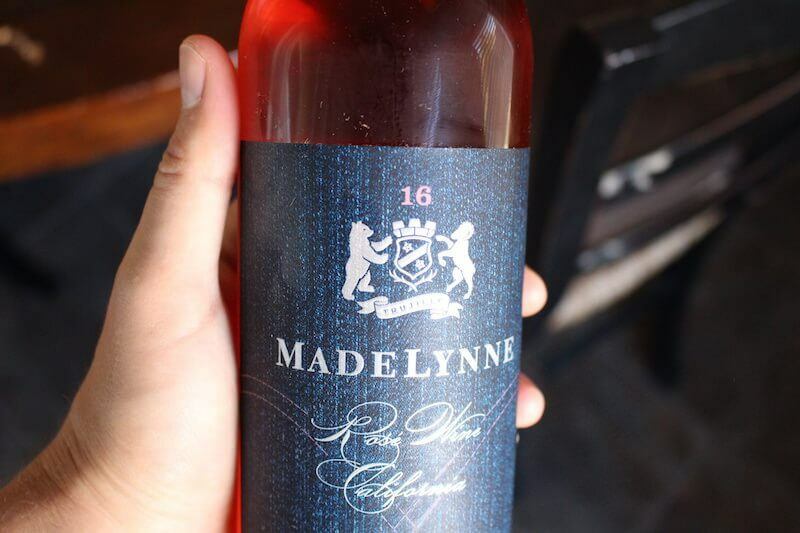 I normally gravitate towards “red” or “white”, so receiving a rosé was a good chance to expand my wine drinking experience. The flavor description guide included in the box came in handy so I could properly describe what I was tasting. They weren't kidding when they said it would have strawberry and other red fruit flavors! This was a tasty afternoon drink for the summer. I was most excited to tasted the “cave aged” cheese from Plymouth, and was not disappointed. This was a very light, buttery, and nutty cheese. It was hard enough to cut into chunks, but soft enough to melt in your mouth. Perfect pairing with the rosé wine! The finocchiona salami certainly sounded interesting, since it's main characteristic was the fennel flavor. It was tasty, for sure, but I failed to really taste the fennel. It tasted like regular ol' salami to me. Unfortunately, the crackers are not very good in my opinion. They serve more as a vehicle for cheese-eating rather than adding much to the tasting experience. As I mentioned above, I was a little disappointed in my second box. It was the same cheese and salami company as last time, so it was less-than-amazing to open up this box. The wine was still awesome though! Pink grapefruit, passion fruit, and melon were highlights of this sauvignon blanc. Another great day-drinking experience for the end of summer (which lasts a long time in California). I'm ready for fall, but we still have some time go. The original Plymouth cheese included in this package was sharper than the East Meadow version, and slightly more acidic. 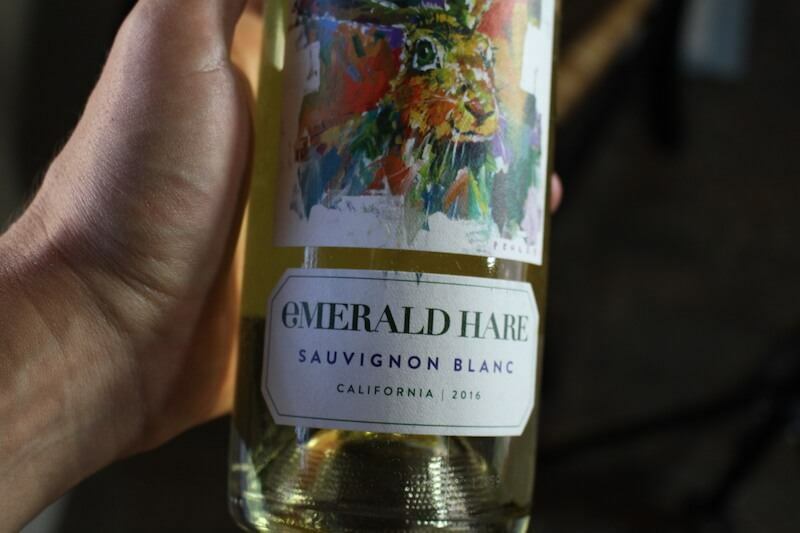 That paired well with the fruitiness of the sauvignon blanc from Emerald Hare included in this box. Unfortunately, the salami fell short of my expectations this time, though perhaps the blandness was on purpose. “Well balanced, mild and lighter taste” were descriptors included in the pairing guide, so it basically tasted like regular salami. It wasn't bad, don't get me wrong! It just wasn't anything to write home about. Unexpected update! Wine Dow Box completely overhauled their website, prices, and delivery method. Now, instead of a drab old cardboard box, you get a fancy presentation! The update makes receiving the package much more enticing. It's more of a “treat” rather than just a shipment of goods. However, the package was basically the same as the previous three times. A great bottle of wine (merlot this time), but the cheese and salami was from the same company. I'm not sure if they plan to mix things up in the future, but now that I know exactly what to expect, it's less of a surprise, and less incentive to keep my membership long term. Variety is the spice of life! However ,the wine was delicious, and I guess that's the main point of the club. Still, it gives me pause to pay $70/month for a wine club that delivers just one bottle of good wine with some not-so-exciting edibles. Did you come to this review looking for a cheese of the month club or a wine of the month club? Because Wine Down Box does both, it means they are unlike any other club out there. Is this club for you? Let's look how they compare to other similar clubs. In my opinion, they didn't do so hot as a “cheese of the month club”. Two months they sent cheese from the same company. Looking at their history, they seem to cycle between companies, and the cheese is chosen to pair with the wine. So the cheese is a secondary consideration to the wine. If you're looking for a cheese of the month club with greater variety of styles and brands, I'd recommend you read my Monthly Clubs Gourmet Cheese of the Month Club review. It's my #1 pick! I haven't tried a lot of wine clubs, but am working on it. I'm currently tasting the wine from Blue Apron and Hello fresh as part of my meal kit reviews. My very basic assessment on the quality of the wine is that I was very happy with their selections. Especially considering that I couldn't just hop to my local bottle shop to get these vintages, it made tasting these particular bottles more enjoyable. If you are just looking for wine though, the $65+ per month cost (including shipping) is a hefty price to pay. You can probably find a cheaper club. If you aren't looking for cheese with your wine, or are a vegetarian/vegan, this won't be the club for you. However, as far as I know, they are one of the only clubs which sends cheese and charcuterie pairings. The only other similar program I can think of is the Di Bruno Brothers Eat Like a Cheesemonger Club , but that does not include wine! I know Blue Apron will send an appropriate wine with your food, but that's not cheese, and you have to cook the food yourself! Cheese of the month clubs will make wine suggestions, or they may have a wine club you could also join, but they don't send a specific bottle of wine with a specific cheese. Wine Down Box is truly one of a kind! Who is Wine Down Box Best For? If you like to drink wine and eat cheese, Wine Down Box is for you, without a doubt. There are many situations where eating cheese and wine is fun. Personally, I like to drink and snack while cooking in the evening. However, you could invite a friend over to chat on a weekday evening while the sun sets. Cheese and wine would be great on a lazy Sunday afternoon too. 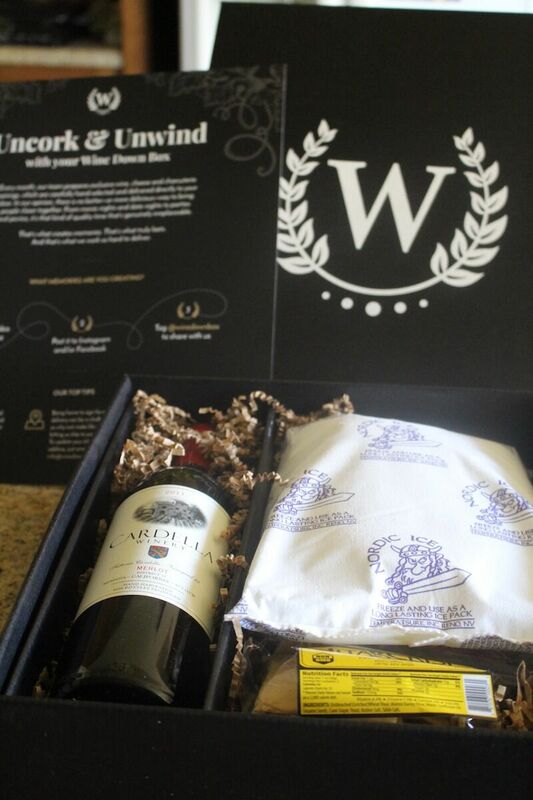 For those that want to explore the flavors of wine and work on pairing skills, the included notes on what to taste in the wine, and how the cheese and charcuterie play into the wine flavors, Wine Down Box is also a great way to introduce yourself. 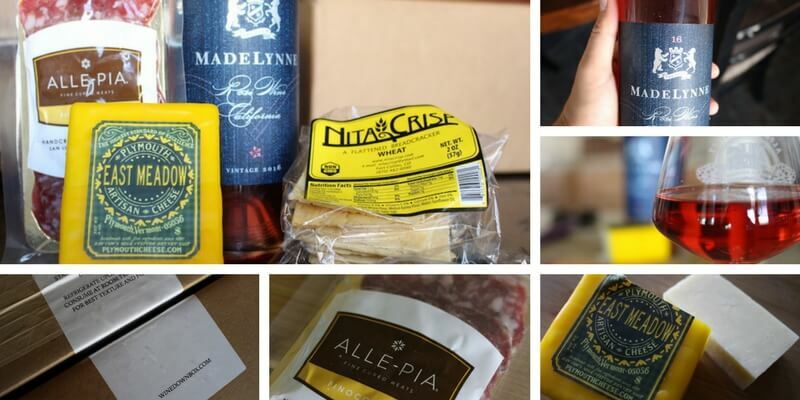 Rather than do all the work of looking up a wine, painstakingly finding a type of cheese that pairs with it, then locating it at the local Save Mart, you have everything delivered to your home, ready to go. It saves you time and energy so you can focus on enjoying the moment! Subscribing to Wine Down Box for 3 months was really fun! The wines were amazing, and reading about how each cheese and charcuterie complimented or contrasted was super interesting. It was well worth the money. ==> Join Wine Down Box Here! However, my main interest in this club was always the cheese. In my opinion, they didn't provide enough variety of cheese for me to remain a long term member. 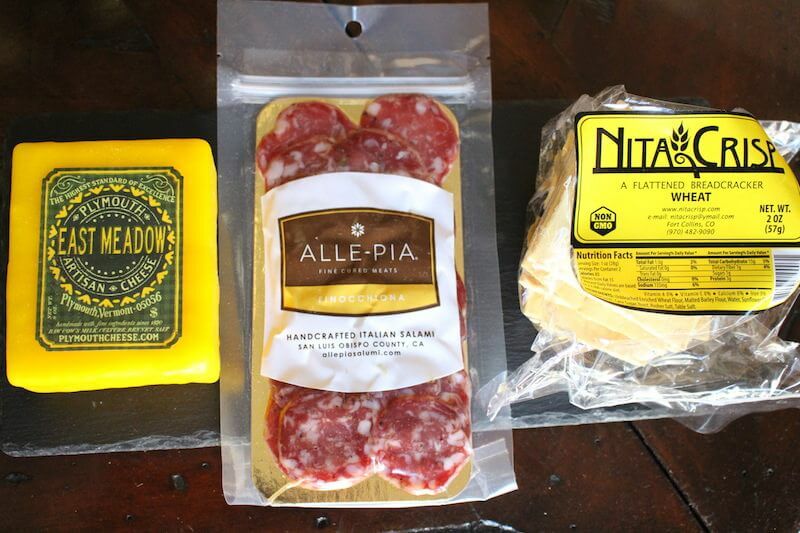 In the future I will continue to be a member of the Gourmet Cheese of the Month Club, and just hop to my local store to pick up a beer or wine to pair based on what that club recommends. Were you a member of Wine Down Box? What was your experience like? Did you enjoy the wine and food selections? Let us know in the comment section! You are here: Home / Monthly Clubs / Wine Down Box Review: How Is This Wine Club Different?